Nobody motivates quite like Mrs. Kate! Your kids will begin with a grin as they sing along with "Give Me a Smile" and learn to work together cooperatively with "Teamwork." They'll be reading and recycling, while learning to be kind and make healthy lifestyle choices. 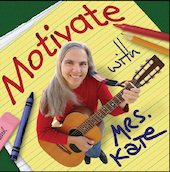 Determination, self-control, kindness, and choosing friends wisely, "Motivate" covers it all. "Hero in my Eyes" humbly elevates teachers, parents and mentors, the everyday examples that kids are looking up to. A character-building classic, these songs are being used in public and private schools nationwide. 1. Give Me a Smile 8. Hey There, Little Conscience! 3. Crack a Book 10. Drugs? Never!